Human beings, in our meaning-making toolbox, have truth and we have fact. But are “Truth” (in the Platonic sense) and “fact” synonyms? Nothing makes the distinction between these words greater than when we apply them to the bible, a work that is almost impossible to categorize as “fact.” When we endeavor to literally interpret the bible, we get into some trouble. Quite a few wars have been fought (and continue to be fought) over literal interpretations of the bible. There is a reason fiction and mythology are more suited to the exploration of ethics and the building of cohesive cultural memories than historical, scientific, or “divinely-authored” texts. When reading metaphorical or allegorical texts, readers don’t need to get bogged down by accuracy: They feel the moral repercussions more immediately, their place in the world more tangibly. Fiction creates a safe space for readers to explore, without the need to refute or prove, cultural history, cultural taboos, the law, and human beings’ place in this confusing cosmos. Certain sects of Christianity, of course, argue that the bible is the literal word of God—the Logos—meaning that God is not merely the story’s protagonist; He is also its author. But one need only glance at the bible’s first book to see overwhelming evidence that it was written over a long period of time by multiple (human) authors. Were it truly the word of God, we would expect to see greater internal consistency in style and content. We might expect God’s character to remain constant for the duration of the story. But the bible means much more for being a work that harnesses the power of fiction and myth—a work that is living, growing, accretive, rather than static; interpretive rather than absolute—to impart a sense of faith and awe, even if, for non-believers, that awe is more literary than spiritual. The first piece of evidence that the bible is neither Logos nor history is the lack of internal consistency in its narratives. In Understanding the Bible, Steven Harris points out many of them. Rather than being the work of a single author, like the Quran, the bible is, according to Harris, “the product of a long process of composition, revision, and repeated editing by different writers and redactors,” which account for the multiple “duplications, contradictions, and other discrepancies” that litter the text (Harris 62). Similarly, in the introduction to the New Oxford Annotated Bible, editor Michael Coogan notes that “modern scholarship has persuasively argued that each [book of the Pentateuch] is composite, consisting of many sources from different periods of Israel’s history” (3). Take the first story of the creation of the world. First, God creates the world and then creates human beings in His image: “In the image of God he created them; male and female he created them” (Gen. 1.27). But a few lines later he creates woman from Adam’s rib: “And the rib that the Lord God had taken from the man he made into a woman and brought her to the man” (Gen. 2.22), suggesting that only man was created in God’s image. Coogan, in his annotation of this section, calls this shift unfortunate: “The man’s rule over the woman… is a tragic reflection of the disintegration of original connectedness between them” (15). Why would an infallible divine author create two discreet origin stories that fail to cohere? As Harris contends, the “documentary hypothesis” of biblical authorship—largely undisputed among scholars—assumes that the old testament has at least four authors, each with a slightly different goal that correlates with the political and spiritual issues that were contemporary to the writing (67). This multiple-author hypothesis is borne out by the bible’s syntactical and grammatical style shifts that clearly divide the prose into distinct categories. As Harris points out, most scholars assume that the Old Testament is a mash-up of four authors’ words and he credits the varying styles in grammar and syntax as evidence to support this theory: J, or the “Yahwist” author (because that is what he calls God, God's actual name), is likely the oldest and in it God is anthropomorphic, quasi-human, interacting freely with His creations (67-9); E, or the “Elohist” source (“Elohim” is what he calls God—the plural for the generic term for "god"), creates a more standoffish deity, who nevertheless finds ways to communicate, directly and indirectly, with humans, though he doesn’t walk-and-talk with them (69-70); D is the Deuteronomist source, and is concerned with an inculcation of Jewish law (70); and P, or the “Priestly” source is the most recent of the biblical authors, and retroactively sanctifies the tradition and authority of priests, while simultaneously solidifying the structure and purpose of the Pentateuch after the Babylonian exile (70-71). Indeed, “When sources are separated,” says Harris, “they not only reveal internal consistencies in style and vocabulary… each of the Torah’s different literary strands consistently exhibits grammatical and other traits characteristic of a particular stage of Hebrew language development” (67). The earlier sources likely come from the oral tradition, and bear more relationship to creation myths of older cultures than do the more recent redactions, which are far more concerned with establishing laws and practices, justifying the rule of specific bloodlines, and post facto justifications of wars, murders, and—in some cases—genocides. The duality and placement of the stories, moreover, suggest that what these authors meant to communicate is something other than factual. One early anachronism in Genesis contends that Cain, after killing his brother (and reducing the number of human beings on earth—if one parses out the etiology—to three), the Lord “put a mark on Cain so that none who came upon him would kill him” (Gen. 4.16). It’s just possible to imagine that this mark protects Cain from his own parents until section 17: “Cain knew his wife, and she conceived and bore Enoch; and he built a city” (Gen 4.17). Unless his wife is also his mother, we see here that the story of Cain and Abel belongs in another part of the bible, after the world has been populated. But it is more likely that the bible’s redactors gave the story pride of place because it has a special resonance or importance. As in Medieval artwork, where the more important figures are larger than the lesser figures, the bible is arranged more symbolically than realistically. It’s a text that creates a literary hierarchy among the players and events that emphasize their relative importance in the ordering of events. Straight chronology can’t do this. The placement of the Cain and Abel story by one of the biblical authors, in other words, has a significance that makes the anachronism worth it. Presumably, something can be read into God’s unexplained preference for Abel’s sacrifice of animal flesh over Cain’s in other senses equal sacrifice of harvested grain. Perhaps, as some scholars suggest, the text is showing God’s preference for a nomadic people over a settled people. 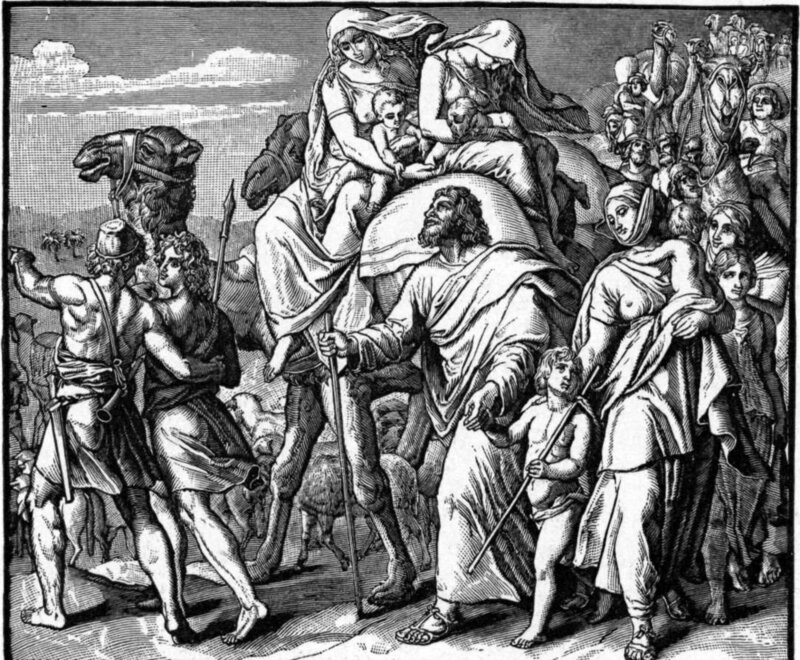 In Traditions of the Bible, Talmudic scholar James Kugel suggests that this could correlate to when this story was composed: God approves of the nomadic sacrifice, right when the Israelites were expelled from the land of Canaan, and forced into nomadic exile (54). One cannot argue that this is a factual telling: But that does not mean it is barren of some form of Truth. That quest [of man becoming God-like], arising from the protagonist’s sole stated motive, drives the only real plot that the Bible can be said to have. But that plot, God’s attempt to shape mankind in his image, would be far more comprehensible if God had a richer subjective life, one more clearly separate from, more clearly prior to, the human object of his shaping (87). Despite this, Miles says, or maybe because of this, the West trusts a flawed, inconsistent character more than a complete, comprehensible one. Whether God created us in His image, or we created Him in ours, the relationship is fraught, but not without love, understanding, and the ability to learn and grow on both sides, somewhat like a new parent with his (His?) children. Along with inconsistency in the story, grammar, and character, the bible’s lessons feel more concerned with creating an ongoing sense of cultural cohesion and united purpose than casting God and humanity as stable and unchanging. That goal is more in line with today’s philosophical valence than the stable eschatology and worldview espoused by Medieval and Renaissance theologians. We’ve seen, in the 20th century, a movement from the search for capital-T “Truth,” in the Platonic sense, to the ascendancy of the “micronarrative,” which, Deconstructionists like Jean-Francois Lyotard contend, can, in aggregate, get us closer to Truth than a single history-by-consensus. After all, he says in The Postmodern Condition, a unified history almost always serves the powerful, not the truth, and “facts” and “stats” are the worst offenders (Lyotard 504). If we want truth, the deconstructionists say, we need contradictions, paradoxical as that might sound. What is the bible, if not a series of loosely connected micronarratives, rife with comforting contradiction? In an environment that rich in fiction, that is where we might find some Truth. Harris, Steven L. Understanding the Bible, 8th Edition. New York: The McGraw Hill Publishing Group, Inc., 2011. Lyotard, Jean-Francois. “The Postmodern Condition: A Report on Knowledge.” Modernism to Postmodernism: An Anthology. Ed. Lawrence Cahoone. Blackwell Publishers Inc., 1996. 481-513. Kugel, James L. Traditions of the Bible: A Guide to the Bible as It Was at the Start of the Common Era. Cambridge, MA: Harvard UP, 1998. Pp. 54-7. Miles, Jack. God: I Biography. Kindle Ed. New York: Knopf Doubleday Publishing Group, 1996. The New Oxford Annotated Bible. Edited by Michael T. Coogan et al. Oxford: Oxford UP, 2007. Woolf, Virginia. A Room of One’s Own. London: Harcourt Brace & Co., 1929. Welcome to my blog site. As you can see, I'm new at it. But I'm trying! And I'll keep trying until my blogs are a pleasant, or at least moderately stimulating, experience. Comments are welcome, especially those relating to how better to blog.